I love looking back at old black and white photos and all the nostalgia that goes with them. I come from a family who have always taken photos, capturing family moments that I still have memories of. I can vividly remember as a little girl going to my grandparents at a weekend and cozying up in their front room for the evening whilst my grandad proudly got out his projector screen and Cine camera. The lights would all go out and we’d relive funny family moments that grandad had caught; whether they were family holidays and days out, celebrations or just my grandad sneakily snapping. I can still remember the distinct noise the cine film made as each frame was played back - it was a weekend highlight. So, when I was asked to be a part of @Dell's creative showcasing historic photographs that bring to life the transformation of how technology has evolved, I was intrigued. It brought back memories of the family Cine camera. I wanted to get out the old battered suitcase of old black and white photos we’ve got stored away in our loft. 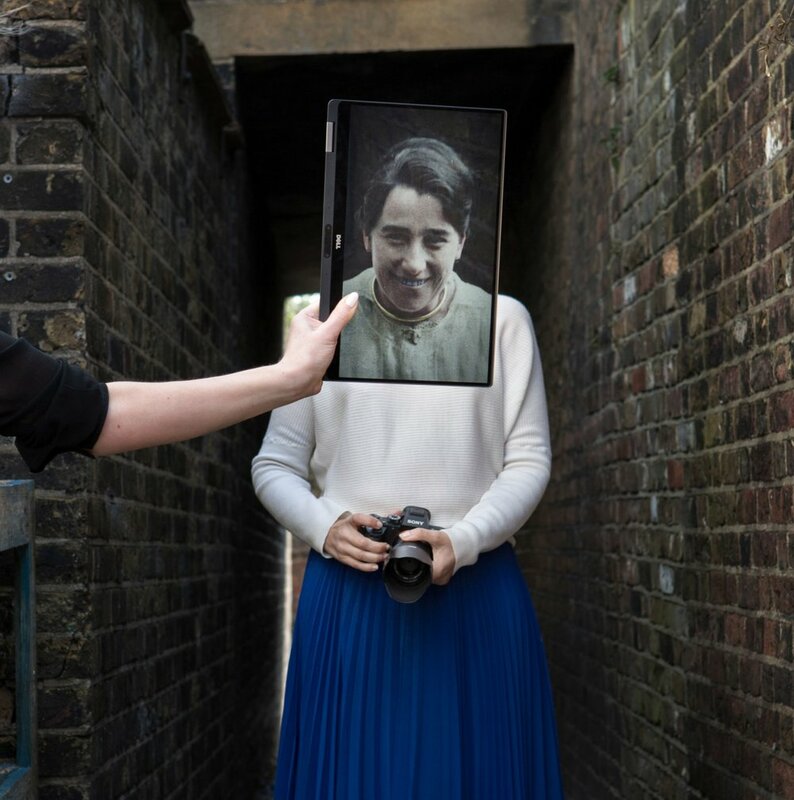 The project features old black and white photos of British workers between 1870-1920 shown on Dell’s latest laptop (the XPS 13 2-in-1) together with their modern-day equivalent. The collection of photos were taken all over London juxtaposing professionals from the late nineteenth century and early twentieth. The original photographs include a teacher, nurse, messenger boy and painter, and they were chosen to highlight how little technology was available at the time to do the jobs that we now rely on technology to do today. Behind the scenes a colourist Matt Loughrey spent six days digitally restoring the black and white archive photos(sourced from the Museum of London and Alamy) in full colour to ensure they could blend with present-day backdrops. Whilst technology is forever changing, we’re still similar to the people from generations ago, even after 100 years. A photographer still captures moments that will live for generations to come; a nurse still cares for patients; a painter still paints and a teacher still inspires children to learn. Seeing the photos side by side shows in a way, that nothing has changed – despite the ever evolving transformation that technology has brought to the roles - the people have the same aspirations, family lives and routines as us. It makes me curious for years to come, who might look at a photo that I've taken (or any one of us takes) and wonder what was happening in the world at that moment.